1. In a large mixing bowl (or stand mixer), combine the flour, sea salt, and sage. Cut in the butter using a pastry cutter and continue mixing until pea-sized beads form. 2. Stir together the cold water and yoghurt in a small bowl. Slowly pour small amount of liquid into the mixing bowl and stir well until a ball of dough forms. Form the dough into a disc and wrap with plastic wrap. Refrigerate 1 to 2 hours. 1. Preheat the oven to 190 degrees. Spread the sweet potato slices over a baking sheet and lightly coat both sides with olive oil, sea salt, and pepper. Bake on the centre rack for 20 minutes, flipping the slices half-way through. Set aside until ready to use. 2. Grate 1 cup-worth of gouda cheese, finely chop sage leaves until you have 1 tablespoon-worth, and slice the cooked beets into 1cm rounds. 1. Heat the oven to 200 degrees, and line a baking sheet with parchment paper. 2. Place the dough on a floured surface and roll into a circle that’s 5mm thick. Transfer to the parchment-lined baking sheet. 3. Sprinkle the gouda and sage over the center of the dough, leaving about 5cms untouched around the edges. 4. 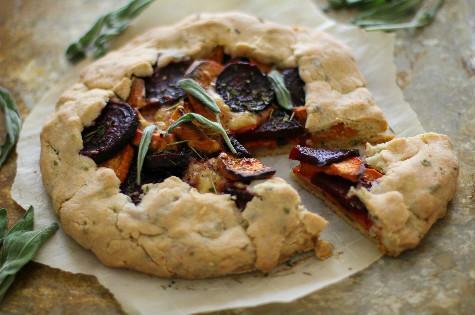 Layer the sliced beets and sweet potatoes over the cheese and fold the edges of the dough over the filling. Press the dough together to seal the edges. Brush the galette dough with olive oil or a beaten egg to ensure the crust doesn’t burn while baking. 5. Bake on the centre rack of the oven for 30 to 35 minutes, or until cheese has melted and crust is golden-brown. Allow galette to cool 10 minutes before slicing and serving.